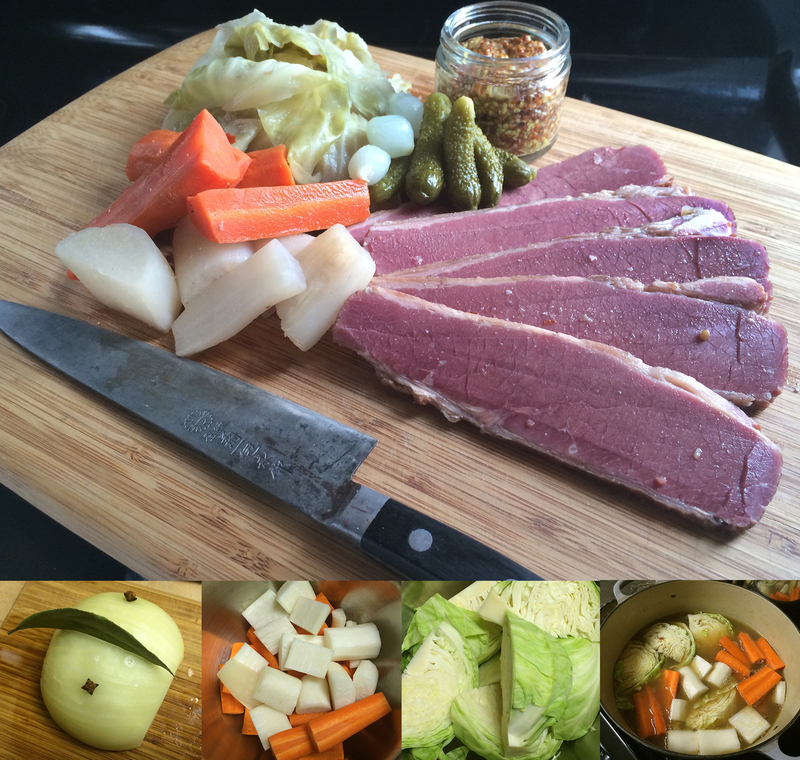 When it comes to corned beef and cabbage, the cooking part is pretty standard. You simmer the corned beef in water or stock until it’s tender, then you cook the cabbage and other vegetables in the cooking liquid. Much of the flavor will already be pre-determined by how the meat was corned, or cured. There’s nothing wrong with using already corned beef. But there’s nothing great about it either. Most come with a package of pickling spice to add to the cooking liquid, and I think D. described the flavor best. Salty. You can certainly doctor up the flavor by using plenty of water, adding a little brown sugar to mellow the salt, and amping up the spices. Still, if you plan ahead, it is worth curing your own brisket. To acheive this, you have two options, a dry cure or a brine (a.k.a. wet cure). Dry curing is easiest. This recipe adapted from the America’s test kitchen has instructions for both dry curing and cooking: Dry Cured Corned Beef. It has a pretty standard flavor, most of us are used to. Brining takes more effort and more room in your fridge, but is more reliable. This brine recipe has a slightly sweet, mellow and aromatic flavor: Home Brined Corned Beef. The source recipe directed us to add pickling spice to the cooking liquid as well, but D. and I found it overpowering (“Too much flavor!”) and unnecessary. Regardless of whether you choose pre-cured with flavor packet, or home cured, we suggest the following recipe for cooking. 1. Remove the corned beef from the brine and rinse well under cold water. 2. Place the meat in an 8 quart stockpot and cover with 4 liters water. Add the onion, bay leaves, and spices to the pot and bring to a boil. Lower the heat to a simmer and cook for 3 hours or until the beef is fork tender. 3. Remove the meat from the stock pot and keep it in about 2 cups of cooking liquid so it doesn’t dry out. Keep warm in a 200 degree oven or let rest at room temperature while you cook the vegetables in the remaining cooking liquid. 4. For best results, cook carrots first, then the cabbage, then the potatoes. 5. Slice the corned beef thinly across the grain and arrange on a platter with the vegetables. Serve with spicy mustard, pickles, and/or relish. Not sure if your brisket is fully brined? If your brisket is very thick, it may take longer than 5 days to cure. Better to check before you discard your brine. Cut your brisket in half and slice off a thin sample from the middle and cook the piece through Pink salt makes the meat turn pink when it’s cooked, so any uncured portion will appear as a sliver of grey in the center. If that happens, return the brisket to the brine and let it cure for 8-12 more hours before checking again. For a low carb option try tender sweet baby turnips or daikon radish instead of potatoes. Tags: Beef, Brisket, Cabbage, Comfort Food, Corned Beef, Food, Irish, Low Carb, New England, St. Patrick's Day. Bookmark the permalink.